One of the larger aspects of Sustainable Building is energy efficiency. One of the main factors of energy efficiency is using the appropriate amount of glazing in our design as it relates to the total floor area in a room or overall building. 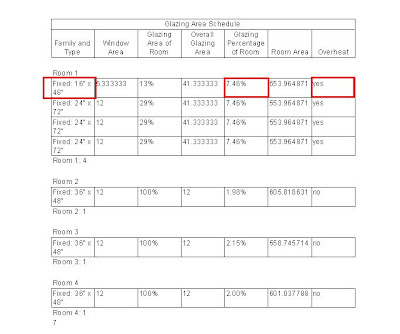 We can simplify this process in Revit and actually create a 'Glazing Area Schedule' to inform us if the ratio of glazing to floor area we used exceeds sustainable design criteria. This will allow immediate awareness of over utilization of glazing in a design. The purpose of this schedule is to inform designers if the amount of total glazing in a room or a building exceeds the desired amount in relationship to the overall floor area. 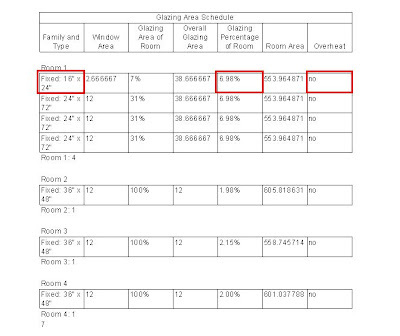 Below is an example of the schedule with two different window sizes, the first that would cause the room to overheat and second that does not. I created the above parameters as Project Parameters associated with windows. These parameters allow for the Glazing Area Schedule to calculate the orientation of each individual window. These parameters will need to be set for each window in the design. This tools is just a concept for leveraging the power behind Revit to assist us in smarter design. With unlimited potential, Revit can help us transcend to the green utopia.